Next up for the Nike Air Max 97 is the return of another original colorway, the Nike Air Max 97 Marina Blue that last released in 2010. For 2017, Nike Sportswear is bringing them back exclusively in women’s sizing. Just like the original, this Nike Air Max 97 resembles the “Silver Bullet” release but replaces the Red with Blue. Featuring a Metallic Silver upper with Marina Blue accents on the Nike Swoosh logos, Air Max unit and also seen on the Black rubber outsole. 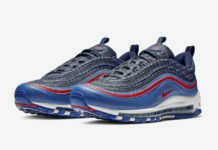 Look for the women’s Nike Air Max 97 “Marina Blue” 2017 Retro to release on July 6th at select Nike Sportswear retailers and Nike.com. The retail price tag is set at $160 USD.